Pronounced Semper-VIE-vum or Semper-VEE-vum, enthusiasts just call them 'Semps'. Sempervivum or 'Houseleeks' are fascinating plants and we are huge fans. New varieties bred in recent years have renewed interest in these plants and they are increasingly popular with some people gathering huge collections. We have many more varieties to offer in the near future including exciting recent introductions from European breeders and some now hard-to-find old favourites. Supplied as growing plants, still in their 9 cm pots. Every plant sent with a durable, printed plastic label - not a handwritten slip of paper. Grown in our own specially mixed compost - gritty, peat-free and containing loam (soil) for superior results. Grown slowly to keep the plants hard and showing their true colours. Accurately named and described. And we show images of each plant taken over the year so you can be sure of what you will get. Our Sempervivum collections come with a basic care leafet. We also offer collections of different varieties in any multiple of 8 plants - 16 different varieties, 24 varieties etc. 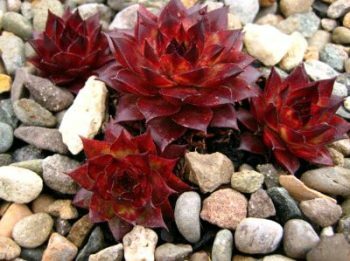 Sempervivum are easy to grow, even by complete novices and are perfect for introducing children to gardening and growing. At the same time, these plants offer enough of a challenge to the more experienced in growing and displaying them really well. They are perfect for the artistically gifted to create unique plant features. Here is the link to our Sempervivum Advice Page where we offer tips on buying, growing and caring for your Semps. We also offer a collection of 8 different plants and multiples thereof - details here.